One sure-fire way to ensure guest attendance to any event or party is to create an appealing invitation card design. 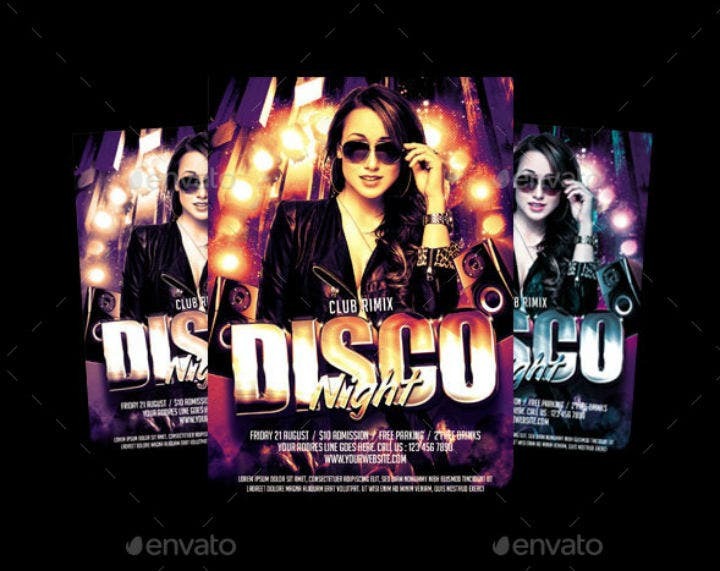 So if you are planning a disco-themed party, the best way to attract and persuade your guests to attend is by using equally captivating disco party invitation cards. And to help you create a compelling invitation card for your disco party, we have curated the most well-designed disco party invitation card templates available online today. 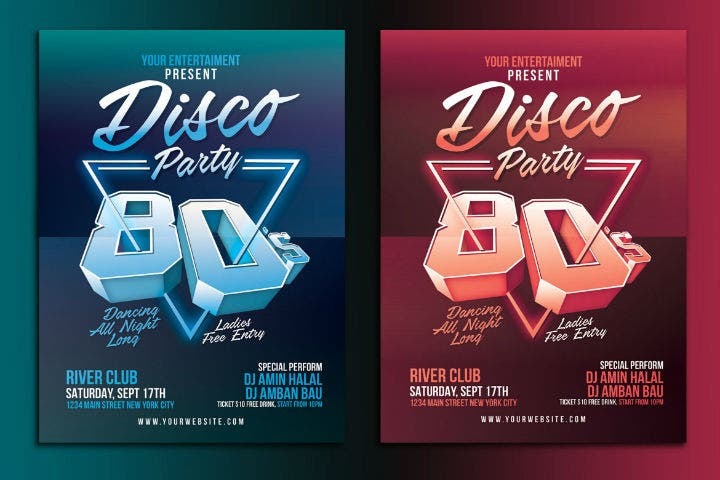 These examples of downloadable disco party invitation templates are embedded within this article along with useful tips and information on how to use them and how to choose the best invitation card template for your own party. And while you are in the business of planning a disco party, take a look at the different disco party invitation templates that we have compiled below. Each template is available either as an Adobe Illustrator template file or as Photoshop template file. Check them out below! What is a Disco Party? The term disco originated from the French term discotheque which means a library of phonograph records. And because live music was prohibited on dance halls in Nazi-occupied places, these places only played music from photographs instead. Over time, the term disco was used to refer to the kind of upbeat music played in dance halls over the world. You may also see summer party invitations. Disco as a musical genre or style that we know of today started in the early 1970s in America. It became a hit among the baby boomer generation producing notable musical artists like The Village People, Bee Gees, and Gloria Gaynor among others. Today, however, this musical style has declined. Disco is now often considered as something that only those in the older generations enjoy. 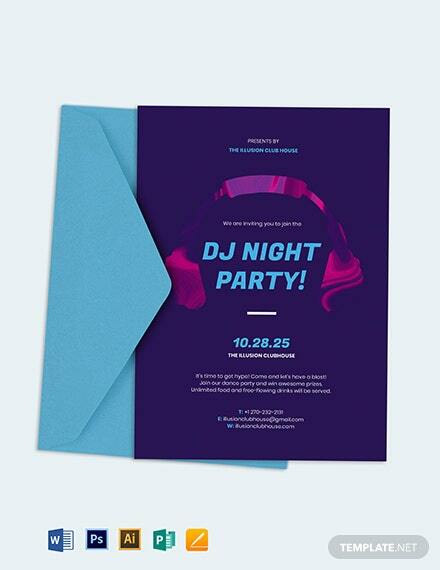 You may also see DJ party invitations. But we beg to differ. Disco is not just for oldies. The disco music that was once popular in the seventies has evolved into the mainstream pop songs and dances that are trendy now. So if you want to plan a disco party, you may choose to strictly stick to the kind of songs that were popular during disco’s glory days. Or, you may evolve with the times and play current dance tunes during your disco dance party. Just remember, a disco-themed party is all about keeping the upbeat and the safe fun nature of the event. You also have to keep in mind that if you are looking for a way to glam up a regular party or celebration that can surely appeal to various age groups, hosting a disco party is the way to go. As we have mentioned earlier, a disco party can help bridge the gap between different generations because of the almost universal appeal of catchy pop tunes. And to add up to this appeal, party hosts and event planners also need to step up their game when it comes to designing their corresponding disco party invitation cards using well-designed pre-made invitation templates. The use of pre-made invitation templates has gained traction over the years due to the increase in computer use and internet connectivity. 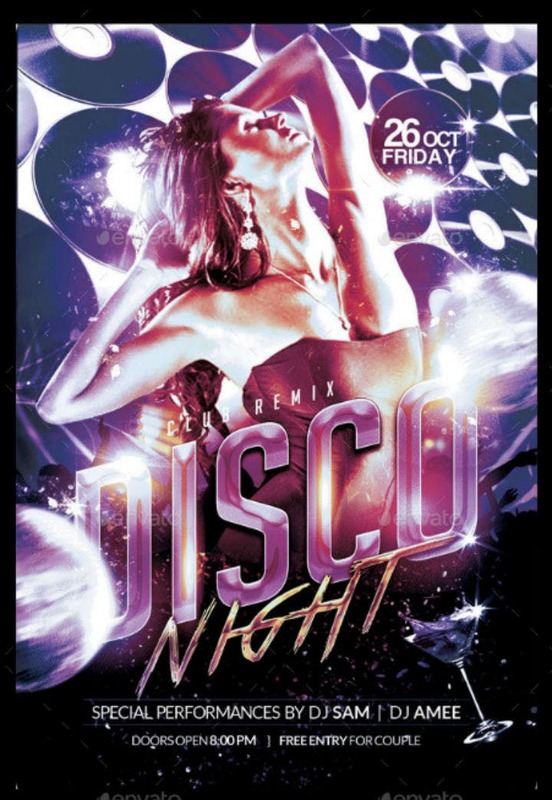 In line with this, we have listed the key factors that anyone looking for a disco party invitation template should consider prior to purchasing any kind of party invitation template. Read these top invitation card selection tips and be assured that you will be choosing what is best for you and your party thereafter. The first factor that any disco party planner should consider when selecting a disco party invitation card is the template’s design itself. You would need to choose a card design that depicts or at least complements the kind of disco party you want to have. 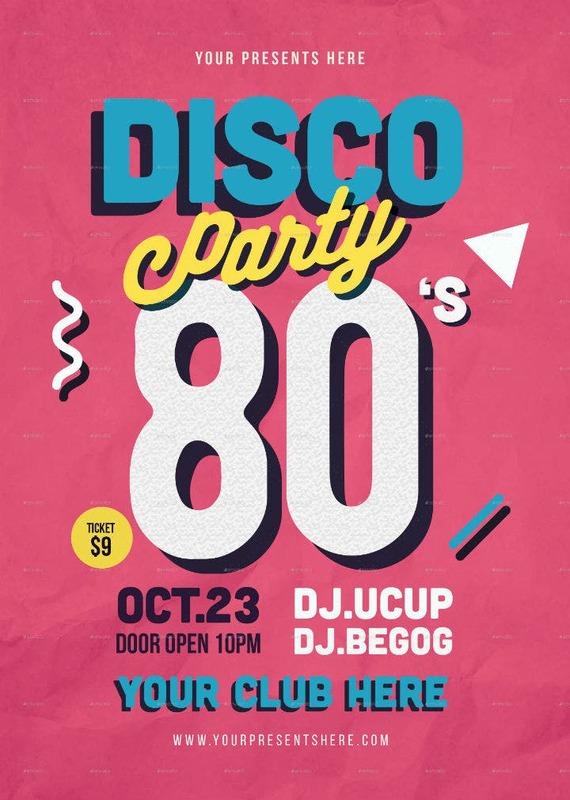 To illustrate, if you are planning an 80s disco dance party, you will need to choose an invitation card design that includes different graphic design elements that are reminiscent of the eighties. 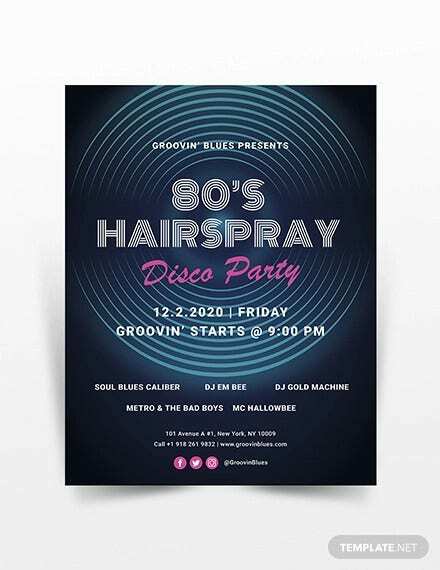 To be more specific, you can add disco ball designs that were popular in that era, selected lines of popular songs, and even memorable pictures of the fashion trends at that time. This is an important factor to consider because your invitation card design is the first thing that your guests will see. It can create an impression on them and subsequently affect their decision whether to attend your disco party or not. 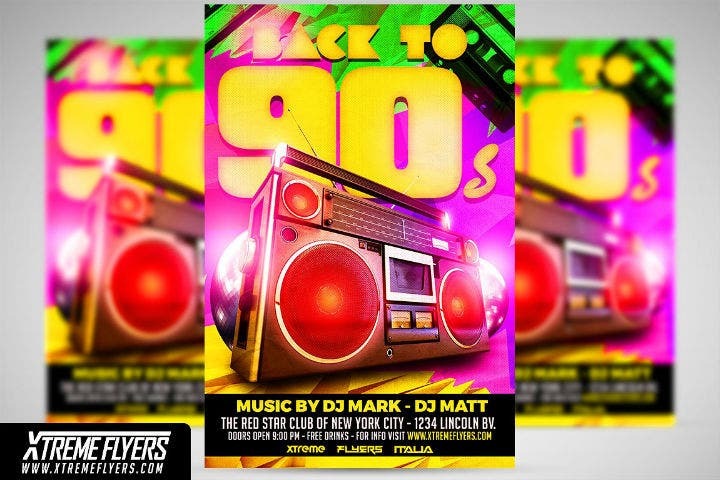 How well designed your disco party invitation card is will also let your guests know, albeit indirectly, how much preparation and effort you have exerted for this disco party. To learn more about designing your own party invitations, check out the linked article. The next factor to consider when choosing a printable invitation card design for a disco party or event is the pre-made template’s price itself. For those who are looking for ways to reduce the amount of money they are spending on hosting a party, you will like using invitation templates since they only cost a few dollars. In addition, you also need to factor in the invitation card template’s base price with the actual cost of printing these templates out. Note that there are certain types of invitation card template designs that may require a special way or format of printing. For example, if you are going for a realistic chalkboard design effect on your disco party invitation cards, you may need to look for a printer that offers different types and quality of printing paper. Often, the higher the quality and the rarer the type of paper and printing format used, the higher the cost of the printing will be. It is important to factor in all these things beforehand so that you will know how much to spend on your party invitations alone. And if you think that there is a chance that you will go over budget, you can always cut down on other party amenities or just scrap the use of that particular invitation card template. For more information on how to make a budget plan, check out the linked article. The next factor to consider when choosing a disco party invitation card template is the template’s customization features. This means that you should look into the degree of personalization that the template allows for its end-users to make. You may also see pool party invitations. 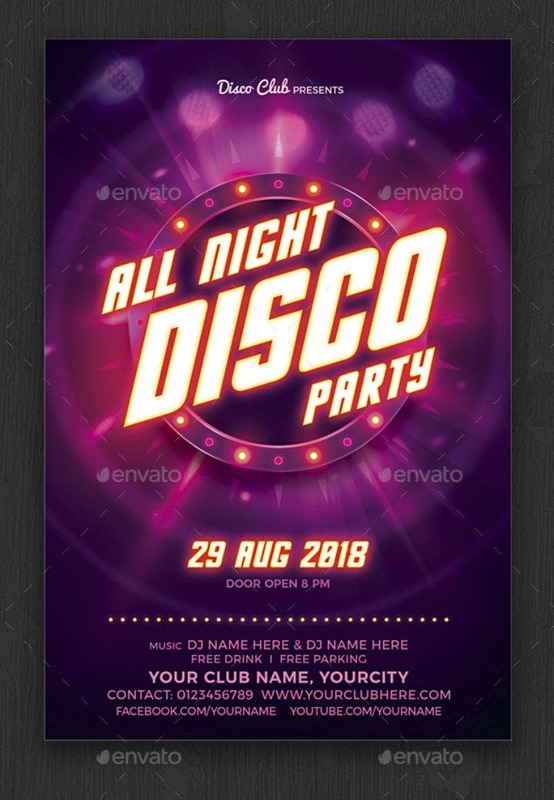 To illustrate, if you have an invitation card template that you like and would want to add your own disco-themed images on the template, you will need to find a party invitation card template that gives its users the capacity to do so. Most often, templates stored either as Adobe Photoshop (PSD) or Adobe Illustrator (AI, EPS) templates will offer this customization feature. Also, disco parties are often a marketing strategy used by entrepreneurs and different organizations. And if you are hosting a disco party for this purpose, being able to edit a template at will allows you to add even more branding identity design elements of your own business and your business sponsors. 4. Template Print Size and Format. When looking for the best disco party invitation card template design, you should always decide on your invitation card’s size first. This way you will already have an idea of what type and size of the printing paper you will use. Sometimes, you may also have to decide on the printing format itself – whether you are using a laser, colored, or other specialized printing. Once you have decided on all these things, you can then begin looking for an invitation card template that supports your preferred mode of printing and print size. Often, the original creators of various pre-made invitation templates will follow their own print size and printing format for their template creations so it is best to carefully check an invitation template’s description page prior to purchasing it. If your chosen invitation card template design is not available in your preferred printing size or format, you may contact the template’s original creator if he or she can create a different version according to your specifications. Or, you may just purchase and download the invitation template as is and then modify the template project layout and design on your end. Be careful when doing this on your own since the entire invitation card template’s formatting and look may be affected when not done right. 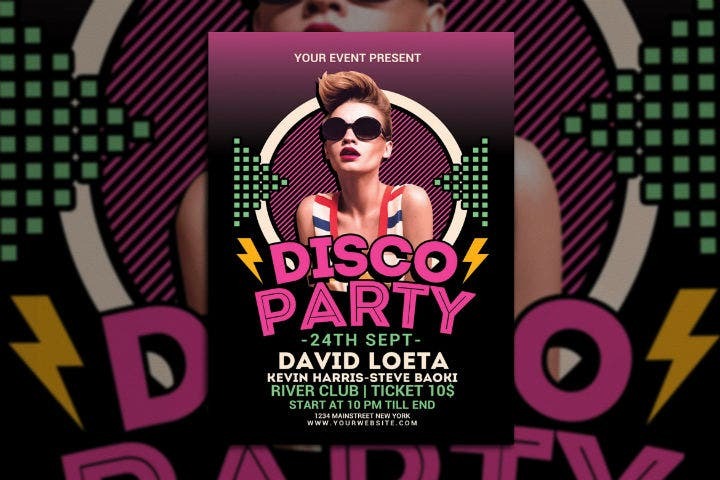 In connection with the previous tip, another factor that all party and event planners should consider when choosing a disco party invitation card template design is the template’s available file download files. Know that the kind of file type a pre-made printable party invitation template is stored as will depend on the original graphic design software tool that it was created in. To illustrate, if Microsoft Word was used to create a disco party invitation template, the template will be available as a Word document template. Likewise, invitation templates created using Adobe Photoshop will be stored as PSD template files. That is why when picking any kind of invitation card template, you should check if it is available in a file format that is compatible with the graphic design software tool installed on your computer. To end this list of guidelines to follow when choosing a disco party invitation template, you should also take note of this last factor to consider when choosing a template design and it is the template design’s overall appeal. At the end of the day, you (the party host and event organizer) will have to live with your own choices. This applies to how you have planned your disco party and the type of invitation card design or event announcement you have chosen too. So if you found an invitation card template that appeals to you and something that you really love but is not available in a file format or size that you originally preferred, then perhaps it is time to make adjustments and listen to your instincts instead. You can always contact the original template creator or professional graphic designer and request for revisions to the template format and size. Or, you can make the changes on your own after learning how to use a certain graphic design software tool. 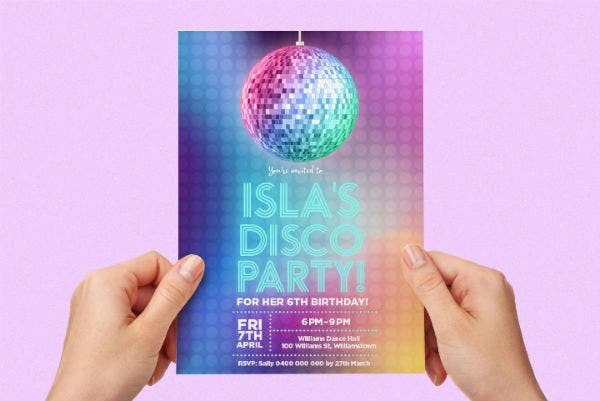 The key takeaway is that you should be adaptable in order for you to get the best – the best in life and, yes, the best disco party invitation card template too. You may also see formal party invitations. 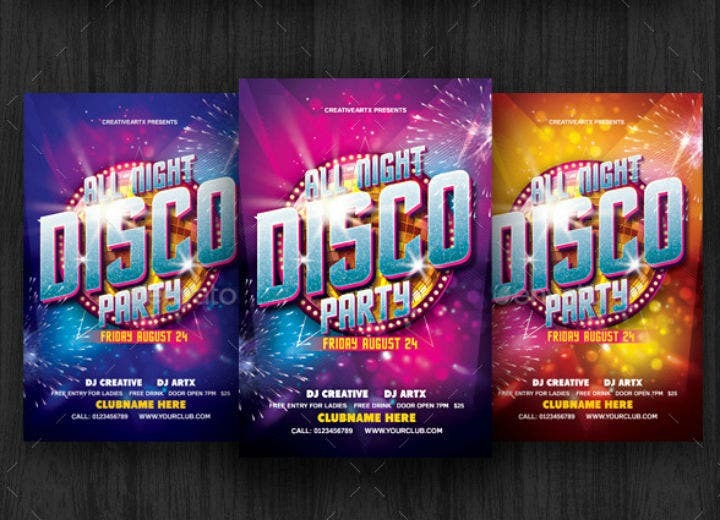 Have You Chosen a Disco Party Invitation Template Yet? 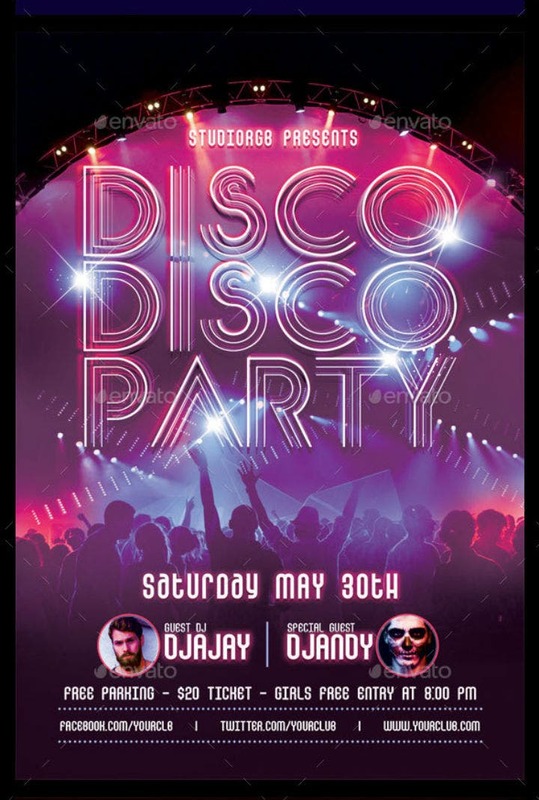 The previews of the different disco party invitation templates that we have included in this article would have surely left you in awe of their amazing designs and template functionalities. So if you happen to like multiple invitation card designs, there is no reason not to download and use them all, right? Whatever your decision is, just keep in mind that that the best party invitation card is the one that will seamlessly convey the theme and message of your party to your guest list. 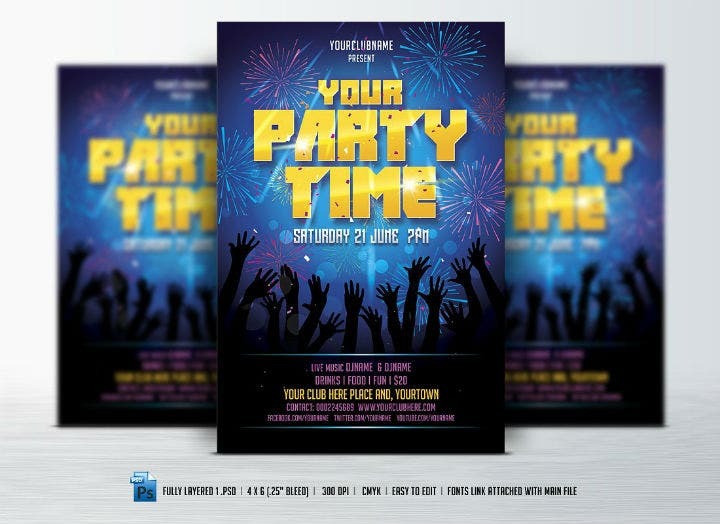 You will know that you have made the right choice when it comes to choosing a disco party invitation template design when you see the large turnout to your celebratory party or event. Until then, work your way towards improving your graphic design skills in creating different party stationery designs and also in planning for everything that may occur in a disco party. Also, do not forget to have fun while doing so! Do not forget to share this article with your friends and followers on social media. You may also bookmark and send this article to your friends and colleagues using email as a form of email marketing strategy. That way, your email recipients can readily access this article right when they open their email clients.